You can get a Bottle of VOSS Water through the Instant Win Game and Sweepstakes, but this IWG only runs through July 31. 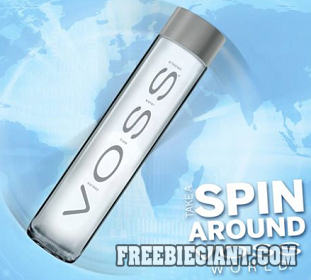 If you would like to enter the Bottle of VOSS Water Instant Win Game and Sweepstakes, simply click here to fill out the entry form via Facebook. You must sign in to Facebook then Like their page to enter the sweepstakes. (480) Fourth Prizes available: One (1) coupon valid for an 800 ml glass (still or sparkling) or 850 ml PET (still only) bottle of VOSS water.